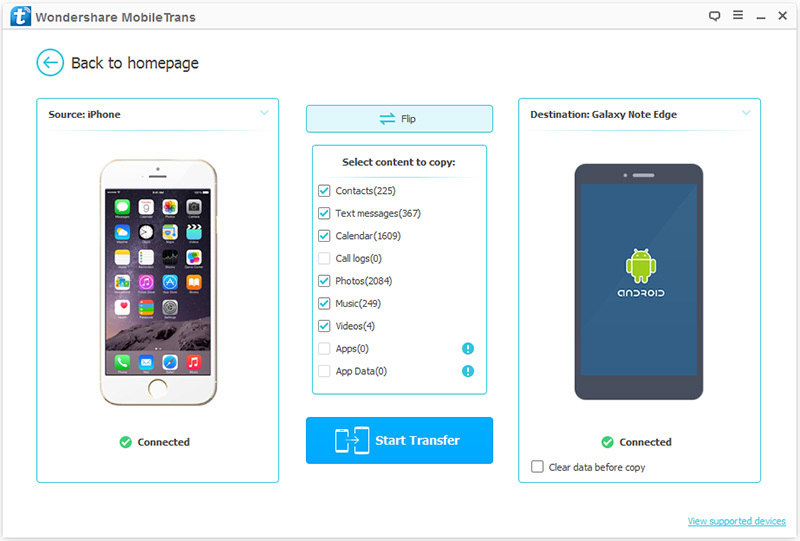 Wondershare MobileTrans is one of phone transfer software available today. It is popular thanks to its efficiency in allowing movement of contacts, messages, images, and video to a new device. After changing phones, the first thing everyone wants is to transfer their favorite content from their old phones. Transferring data from an old phone is fun but can be frustrating if the apps involved are limiting and costly. This is why you need a transfer software to make the job easy and quick. Wondershare MobileTrans is a leading software that keeps data safe during the transfer process. It is also the most popular tool for iPhone to Android sharing. Part 1. Is Wondershare MobileTrans Free? Wondershare provides registration for premium services for their users. However, the tool has different type of licenses from $29.95 and available for download from their website. You can start enjoying the benefits of Wondershare MobileTrans by simply visiting the site and downloading it. MobileTrans is designed by wondershare to allow moving data between Android, iPhone, and Symbian with just a single click. It has been used by many people over the years to earn its current reputation and dependability. It will give you the confidence of frequently utilizing it whenever you need to move your important documents to new phones. The tool allows transfer of music, sms, contacts, videos, images, as well as call logs. It has the capacity to accommodate up to 2000 phones. You can also backup your phone data to PC. This tool has unlimited options for data storage and transfers. It is also designed to extract backed up data by Samsung Kies, Blackberry and iTunes and transfer to your new smartphone. It supports a variety of networks such as Verizon, AT&T and TMobile among others. Most importantly, MobileTrans is risk-free and ensures total security of data quality. It is available for free downloads hence easily accessible. It is also easy to use and you will not be needing any extra knowledge and skills to operate it. Anyone can use Wondershare MobileTrans with ease thanks to its simplistic controls and direction options. This tool automatically fixes corrupted files and fragments to ensure that you get the right music file suitable for your device. It does not distort the audio quality of your music files when transferring the files from one device to another, from iTunes to your device or from your PC to your device. You can't use it to transfer from phones to PC/iTunes, vice versa. It doesn't support to selectively choose the files you want, you can only transfer all the files in your device together. iMyFone TunesMate is also an efficient way you can try to transferr media files safely especially between iPhones and PCs. Among other things, you can also use it to synchronize iTunes library to iOS without overwriting the previously exist data. It also help you rebuild previously damaged or corrupted iTunes library or move different types of media files such as music, videos, photos, playlists, ringtones, podcasts, audiobooks and many others. TunesMate offers a free trial and you can enjoy transffering some files for free, but you have to pay for it to enjoy the extra features it provides. The price is cheap and affordable to most users. Other iTunes alternatives come at a heftier price making Tunesmate the most accessible and budget-friendly tool for file transfer. If you are wondering whether it is worth to buy TunesMate, consider the benefits it comes with and the features it provides to the users beyond fundamental file transfer. The trial version is only an introduction to the benefits of TunesMate. The full-version comes with a license, updates, and free technical support. It costs as low as USD 29.95 for a year’s licensing. The most popular license is Family License which supports up to 5 PCs. 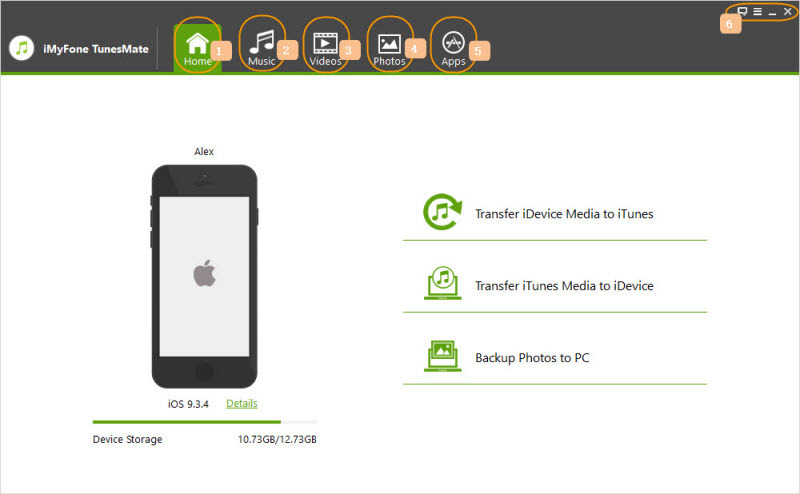 You can easily transfer and manage your music, podcasts, playlists, videos, movies, TV shows, audiobooks, photos, ringtones etc. It allows you to share music back and forth with your friends from different Apple IDs. Easily import, export, edit any information about your music like the playlists, ratings, album, artists etc. Selectively transfer the files you want to your iPhone without blind syncing all data at once. You can use it to backup your device and restore it whenever you want. Here we provide you a special gift. You can use the discount below to purchase iMyFone TunesMate cheaply.